Just a brief update on the cleats. It has been reported to the Union Office that Road Supervisors are now out delivering the cleats to Operators and informing members they must be worn as Personal Protective Equipment (PPE). If you have been told that WCB will not support a claim if you are not wearing the cleats; this is in fact wrong. WCB is there to protect workers for all workplace accidents, cleats or not. Management has committed to an ergonomic assessment to determine if the cleats are suitable for our Operations footwear. Local 583 posts an agenda for the Regular Meeting every month. It often just mentions “Regular Business”. Items which get identified on the agenda which do get posted include: audits, constitutional charges, elections, nominations, election challenges, bylaw amendments, regular meeting changes and arbitrations. This is a fairly complete listing. The Local doesn’t usually post expenses to be incurred; expenses incurred by Local 583 usually come under Communications and New Business from the Executive Board or the Floor. The Regular membership on the floor on meeting day discuss and vote on the expense. There is also a question period after the reading of the Local bills which the membership votes to approve. These votes to approve expenses are democratic. This has been the process for many years under many administrations of ATU Local 583. The posting of expenses was proposed approximately 8 years ago as a Bylaw change and it was defeated. The Executive Board is elected by the membership for their ability to lead the Local with well meaning decisions. This is one of the steps of our democracy. Another democratic step is the members on the floor of the meeting that day, making the decision. If the Executive was to post an expense deemed controversial (and what defines controversial is likely different to everyone) the members who regularly show up at meetings should make the decision, not those who are showing up for the controversy. We had 80 members who regularly attended 6 or more meetings in 2018 using meeting rebate cheques as a reference. A decent cross section of opinions for the Local’s decisions. A monetary motion came before the floor recently as recommended by the Executive Board; Local 583 needed a new photocopy machine because the old one was no longer functioning properly. The cost was $270 per month on a 60 month lease. Our Financial Secretary Treasurer researched three or four different machines and the Executive Board felt the one suggested was best. The motion was made recommending the leasing of a new one and after some debate a motion to table the purchase was made, seconded and carried. Again, a democratic process. 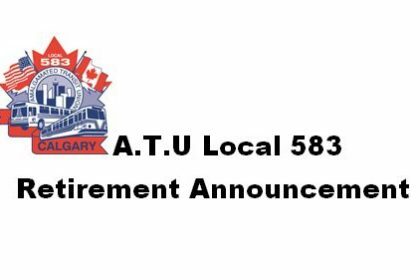 Before it was untabled at the next Regular Meeting the Local had to produce the already approved booklets for the ATU 583 Retiree’s Banquet. Our machine failed when we tried to produce them so we had to send them out to be produced. Unfortunately, this cost the Local an extra $1,200.00. February 28, 2019 is the last day to get your medical, dental and Health Care Spending Account (HCSA) receipts in for reimbursement. Some members have set up their accounts so all expenses roll seamlessly into the appropriate accounts, but for those who haven’t it is time to submit your expenses. Don’t forget to claim your extended health and dental premiums! The premiums can be applied to your HCSA for reimbursement. The needed information can be found on your pay advice slip in the “after tax benefits” box. If you are having any problems figuring this submission out just ask one of our Local 583 Stewards for help. You may also call the office or catch the Full Time Officers at a Garage Visit to get some help. The next Garage Visit is at Victoria Park on February 26, 2019 and OBMF on February 21, 2019. If you are still having trouble getting your paystubs (26 is still needed here) just call HR at 403-268-5800 and they will set it up for you. Greyhound Canada Transportation ULC Western Operations shut down their operations on October 31, 2019. This has resulted in ATU Local 1374, who represents Red Deer Transit and Brewster Inc. having to decide on a new direction. One of their choices was to join our Local. They have endorsed this choice with a membership vote on January 25, 2019. The International Union now requires our Local to vote to bring them into our membership. This discussion and vote will happen at the February 12, 2019 Regular Meeting. Boom cards should be coming in soon and will be mailed to your address on file. As we continue to remind you, if anyone has changes to their personal information such as an address change that ATU 583 is not aware of please call the office to update us before the cards are mailed. An update on the new Stoney Trail Facility, at the time of this writing Calgary Transit is one week away from taking occupancy of the building. In the Maintenance Area the signups are completed and all positions available have been signed on. Currently the only area that has to be completed is the Parts Department. Local 583 is currently waiting for Supply to complete the sign-up process for their area. This world class facility will take the full 1.5 months to get set up for service to begin in March 2019 and a lot of work has been done by the Coordinator to get the facility set to open with limited resources. There was a big move of buses at the beginning of December 2018 to prepare for the opening of Stoney and that will be completed when CT takes over. All Maintenance personnel will be required to complete an orientation at the new facility prior to being granted access to the building. Thanks to Craig Szilagyi for arranging to have the Local 583 Stewards up to this facility for an evening tour at our next Steward’s meeting. Francisco Olandesca – Operations – 31 years – Aug.
Paul Dhanaraj – Operations – 39 years – Sept.
Roger Doubleday – Operations – 16 years – Sept.
Richard Holyoak – Operations – 28 years – Sept.
Art Iverson – Maintenance – 28 years – Sept.
Dave Love – Maintenance – 18 years – Sept.
John Dean – Operations – 21 years – Oct.
Kevin Elford – Operations – 20 years – Oct.
Anna McDougall – Operations – 18 years – Oct.
Vijay Nand – Operations – 20 years – Oct.
Fred Plumridge – Operations – 27 years – Oct.
Don Poole – Operations – 30 years – Oct.
Nizar Rhemtulla – Operations – 27 years – Oct.
Barry Rust – Operations – 17 years – Oct.
Hoa Van Vo – Maintenance – 37 years – Oct.
Carole Blackstock – Operations – 27 years – Nov.
Brad Carp – Maintenance – 31 years – Nov.
Colleen Cooper – Operations – 10 years – Nov.
Axel Fischer – Operations – 19 years – Nov.
Jaswinder Sull – Operations – 22 years – Nov.
Robert Sim – Maintenance – 37 years – Nov.
Wayne Boychuk – Operations – 21 years – Dec.
Barry Chernecki – Operations – 40 years – Dec.
For your information: ATU Canada has a mandate from its last convention to research diversity and inclusion to help understand all the issues that our Sisters face in the workplace. There is a link to a survey posted on our website’s news and media section for any interested member to fill out. Please consider filling out the survey and help give direction to this important initiative.